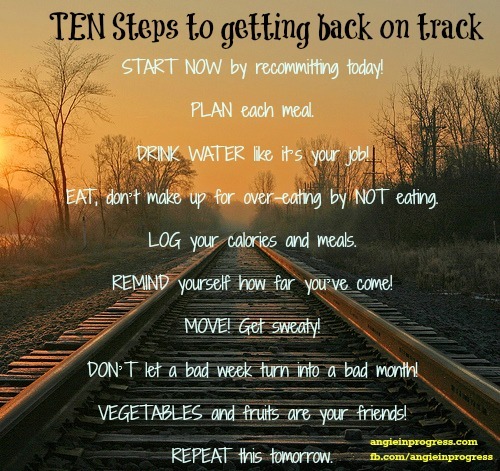 TEN Steps to Get BACK on TRACK! Did you get off track a little over the holiday weekend? It is such a challenge when you’re traveling, visiting friends and family, and eating food that you wouldn’t normally eat. On top of that, maybe you were away from your fitness gear, your gym and your routines. Luckily, it just takes a Monday to get back at it. I’ve got my workouts scheduled for the week. It always helps me to see them, know what’s coming, and check them off as I go. Every little bit helps. Give yourself movement opportunities whenever possible. Too busy? Break up your workouts if you have to! If you don’t have a solid hour to commit, than try two 30 minute sessions sometime during your day. One hour is 4% of your day. No excuses. You indulged over the weekend…SO WHAT! You’ve got the plan to get back on track, put it into action today! And if you’d like a little more accountability and help from me in December, join me on Facebook for a 30 Day Challenge www.facebook.com/angieinprogress. We’ll workout, eat healthy foods and keep each other accountable, all via a private Facebook group. It’s AMAZING how much better you’ll eat and the kind of results you can get in this type of challenge. 😀 You can do this, and I can help! I LOVE LOVE LOVE this list. Got right up from reading this and filled my water glass. Previous PostPrevious When in Doubt, Add Butter! Next PostNext What is this “Clean Eating” you Speak of?